Jacob Eisenberg gives a little bit of love to the Yankees’ most consistent pitcher. On Jan. 14, 2012, the Yankees made two acquisitions. In the first one, the team traded for a prodigious 22-year-old with an electric fastball and a mammoth frame who reminded scouts of a young CC Sabathia. To many, the 22-year-old’s addition signified a securing of success in both the Yankees’ short and long-term plans. In the second acquisition of the day, the Yankees signed a 37-year-old veteran with a career record of 53 wins and 56 losses. Although the 37-year-old had been known to be a better pitcher than his record suggested, the move was perceived to be a mere throw-in on a busy day of dealing. To many, the 37-year-old’s signing would be, at most, a minor commitment for New York. He would serve as a stopgap for the team only if other pitchers got injured. What a difference eight months make to public perception. While Michael Pineda, the 22-year-old “prodigy,” has been injured all season with a torn labrum, Hiroki Kuroda, the 37-year-old “insurance policy,” has developed into the Yankees’ most consistent and dominant pitcher. The decision to sign Kuroda seemed suspect from the start. After all, his sub-.500 winning percentage in five years of pitching was hard to overlook. Furthermore, he had been pitching in the National League, and it has long been an accepted fact that the American League is the stronger league comprised of better teams with significantly deeper lineups. Most assumed that Kuroda’s marginal-at-best success in the National League would translate to even less success in the American League. Moreover, Kuroda was from Japan and had never faced the wrath of the New York media, which had ripped Kuroda’s Japanese predecessors Hideki Irabu and Kei Igawa apart during their short-lived Yankee pitching careers. As expected, the Yankees’ fans were apathetic toward Kuroda’s signing. After acquiring Pineda, adding Kuroda looked like the Yankees were throwing $10 million at a pitcher who might not even make the rotation. With CC Sabathia, A.J. Burnett, Phil Hughes, Freddy Garcia and Pineda on the payroll, the team was already committing nearly $50 million for the 2012 season to five pitchers. Another $10 million to the payroll for a sixth pitcher seemed superfluous. Now, entering the height of the American League’s pennant run, the Kuroda signing has become anything but superfluous. 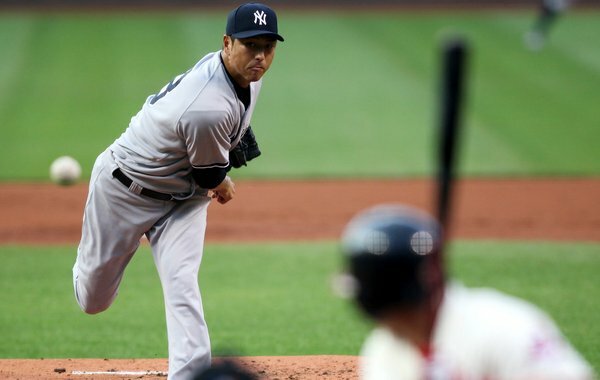 After a rocky first two months of the season during which fans and media members called for the Yankees to remove Kuroda from the rotation, Kuroda has made the necessary adjustments to adapt to the American League and has silenced the critics who doubted he could pitch in New York. To say the 37-year-old has been consistent would be an understatement: in his past 19 starts, Kuroda has pitched into the seventh inning in all but one of them, and reached the ninth inning in four of his past five. His high point of the season came on Aug. 14 when he threw nine shutout innings of two-hit ball against the American League-leading Texas Rangers. Kuroda, who had been the victim of awful run support from the Dodgers for years, figured he would finally have enough offense behind him in New York that he could win games even if he did not pitch masterfully. While Kuroda’s porous 13-16 record in 2011 signified a forgettable season, Kuroda actually finished the year with a career-best 3.07 Earned Run Average (ERA) — the ninth best in the entire National League. To put it another way, Kuroda has the same number of wins on his record as CC Sabathia despite receiving, on average, more than two runs more per game, fewer in run support. Kuroda leads the Yankees in ERA, Innings Pitched, Quality Starts and, perhaps the most indicative stat of value, Wins Above Replacement (WAR) — which calculates how many wins a player has earned for his team over a league-average replacement player. As the 2012 season winds down and the Yankees continue to tread their slimming first-place lead in the standings above Baltimore and Tampa Bay, the team can only look back on that eventful day in January and feel lucky they signed the best insurance policy available. If the playoffs come around and the Yankees are fortunate enough to make it, they will have to attribute much of that good fortune to the “throw-in” of a busy Jan. 14.